The Solar Light Angel brings comfort and peace with her flowing detail and brilliant light. She is so beautiful in the cemetery, but we also love her on our patio in a planter. It's amazing that she lights up every n ight throughout the seasons. The Solar Light Angel stands 14" tall and 10" wide and comes with an attachable ground stake and two solar rechargeable batteries. WEATHERPROOF - Composed of weatherproof acrylic so that you can display your Angel all year in any weather condition. Rain, Snow, Sleet, or Shine! 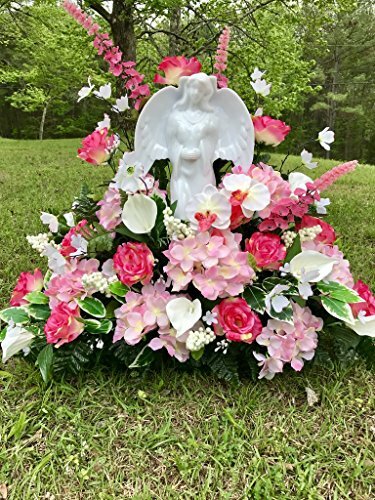 PERFECT MEMORIAL FOR YOUR LOVED ONE - Perfect Cemetery Decoration but we also love her in our flower garden! If you have any questions about this product by Eternal Light Cross, contact us by completing and submitting the form below. If you are looking for a specif part number, please include it with your message.